BOOK OF HOURS -Leaf in manuscript, written in Latin on vellum. BOOK OF HOURS - Leaf in manuscript, written in Latin on vellum. Title : Leaf in manuscript, written in Latin on vellum.. Size : 4.0 x 2.3 inches. / 10.2 x 5.8 cm. Description :RECTO: one 2-line and six 1-line initials in burnished gold and colours, on the right-hand side a bar border in gold and colours. 3-sided illuminated borders with multicoloured flowers, leaves on black penwork branches. VERSO: four 1-line initials and illumination as on recto. 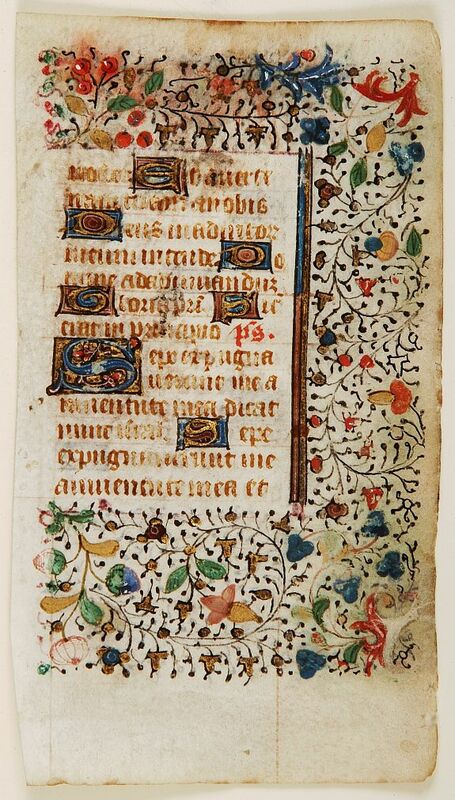 Condition : A quaint little leaf from a Flemish book of hours, 13 lines of text. Slight rubbing and thumbing (of using the book) on recto, more so on verso.